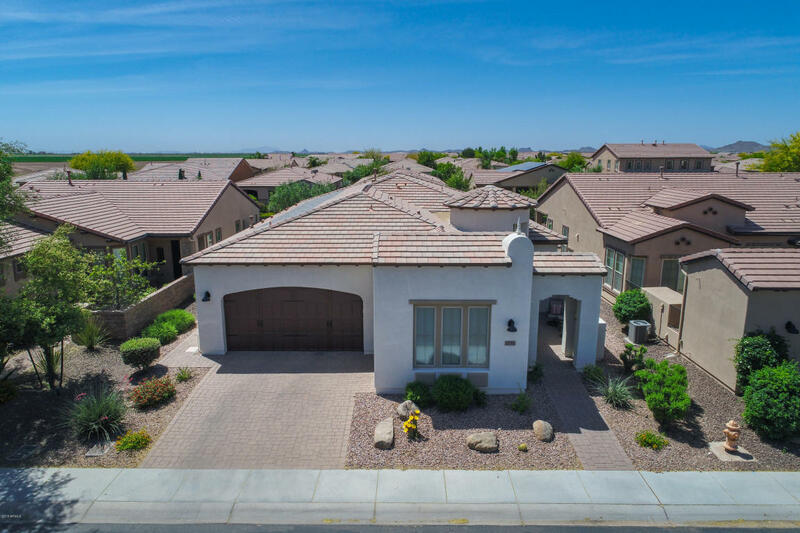 This beautifully maintained GENOVA model w/NEWLY painted exterior & owned 4 KW solar system for energy $$avings, N/S Lot (S facing Backyard), & a separate Golf car garage. Great room Floor plan features 2 BRs, 2.5 Baths an enclosed Den/Office/3rd BR, Formal Dining Rm. All Kitchen/Laundry Rm Appliances convey, Kitchen w/Granite C-Tops, SS Appliances, Maple Cab's, Gas Cooktop, built in Oven & Microwave. Beautiful tile flooring throughout w/carpet in BRs & Shutters throughout. Out from the two Rolling Walls of glass lies a very private Entertainer's Paradise featuring a covered patio w/gas F/P, extended patio, built-in BBQ, Water feature & included spa. Garages w/epoxy floors, attached Storage cabs, Water Softener & R/O systems, & more! Come enjoy the renowned Encanterra resort lifestyle.